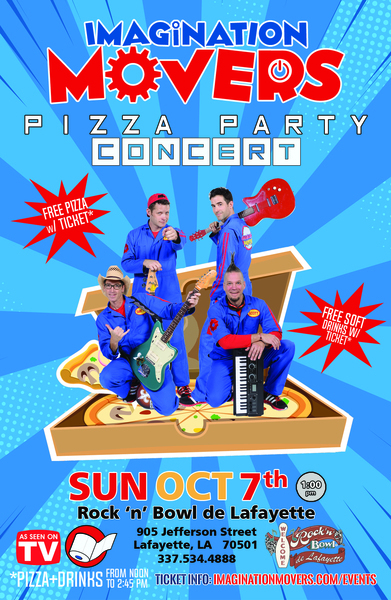 The Imagination Movers are throwing their 1st ever Pizza Party & Concert and you're invited. 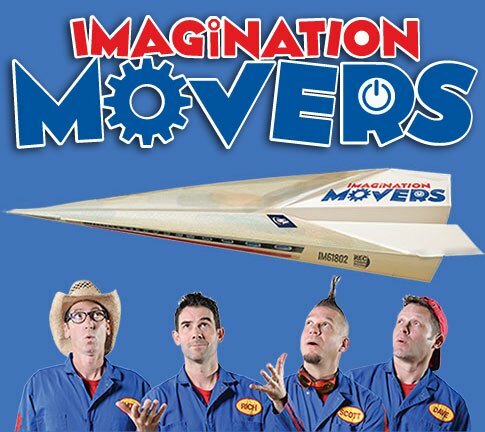 That's right, the Emmy-award winning Imagination Movers are bringing their interactive, family-friendly rock concert to Lafayette, LA along with some high-flying (toilet paper that is), smoke ring-skying (can you say, "Vortex! "), and new song stylings for everyone to enjoy. So, come and spend an amazing and truly interactive Sunday with your family and the Movers as they play all your old favorites and some new at Rock 'n' Bowl de Lafayette. The concert starts at 1 pm but the doors open at 11:45 am. Eat some 'Za and then dance it off! 1) General Admission (GA), and 2) General Admission+Meet & Greet pass (GA+). Do know - there are a limited number of GA+M&G tickets available. Also, included in the price of the ticket is FREE pizza and soft drinks/H2O, available from 11:45 am - 2:45 pm. Get your tickets now.